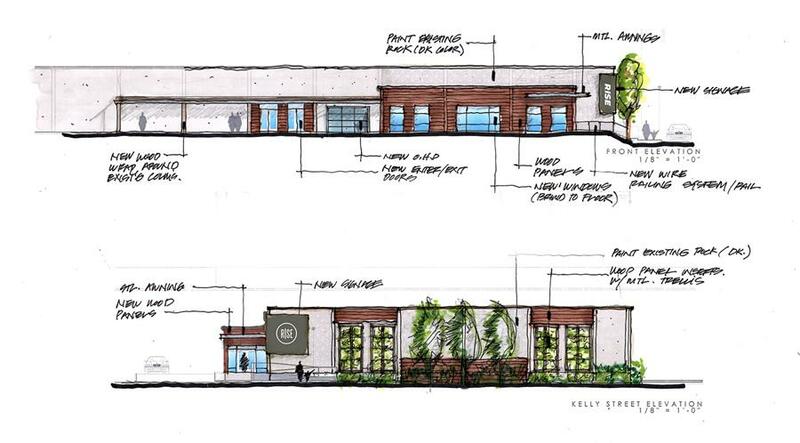 Sunday was really exciting to be able to share some of the sketches, layouts, and vision behind our future facility. Months of research, planning, iterations, and forethought have gone into making the best use of this space possible. 01 Flexibility We have lots of different sized spaces for all kinds of different events, classes, gatherings, & trainings. There is a 1,200 sq/ft space in the kid's area, a 2,000 sq/ft co-work lab, a 3,500 sq/ft foyer, and a 5,000 sq/ft auditorium. What this means is basically no matter the size we need, we have the flexibility to accommodate. The Auditorium will have massive barn doors that open up into the foyer for expanded capacity during larger gatherings over 400 people. The kids' classrooms have flexible sizing. And there will even be a coffee shop that is open to the public 7-days a week! 02 Capitalize on Current Architecture This facility actually has some incredible architecture we will be integrating into the design of all we do. Giant wooden beams that are nearly 100 ft long, over 4 ft tall and nearly a foot thick span the width of the building. Those will be exposed and in the open. Concrete walls, and giant steel brackets will be combined with clean new walls to bring a modern and unique design. All the exterior design capitalizes on the unique feel this facility has yet with a repurposed feel. There are three important numbers for you to know. We had a commercial company give us a bid on what it would cost to build this out if we completely bid this out to contractors. That number was estimated at about $1.2 million. The joyous thing is we've had such overwhelming response of willingness to help and offers from professional trades, that number is now closer to around $600k-$700k to fully complete the work. Yet, we also know that one option for us is to get into this facility bare bones (walls, electrical, plumbing, basic fixtures, etc) at around $300k. I hope these are really encouraging numbers as it gives us many paths into the facility. We've already paid the $500k down payment. We've already set aside $500k for major facility improvements (roof, structural, & hvac). In order to be financially prudent, we are setting aside $200k in reserves to help offset the cost of our monthly payment until we know what we will get for our leased space and our cash flow in the coming year. With what we've already raised, our goal is to raise an additional $300k to get us to a reasonable position for occupancy. So the last thing we are asking for is our church's participation in raising of these final funds we will need to occupy. Most of you have given and sacrificed towards this endeavor already, and it is that generosity that has gotten us to this place where we are! Many others of you who have joined our church in the last year will now have the opportunity to join us. And now that we have this incredible opportunity before us, some of you who have already participated will find yourself in a position to seed into this endeavor even more. So here is what we are asking: will you join the rest of us and invest in this endeavor of planting our presence deep in the heart of our city? We believe these goals are absolutely obtainable over the next year. But it will take all of us relying deeply on God to make this happen. We are asking each and every person to PRAY and ask God to give you a dollar amount for you to give. We will give a one-time up-front gift in 2018 plus a 10-month commitment through October of 2019. 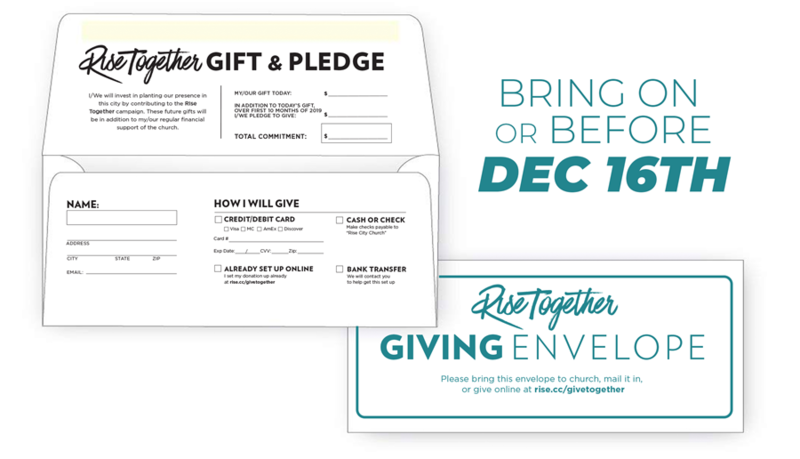 Together we will bring our gifts and pledges on Give Sunday, December 16th at 4pm or 6pm. God has been so good to us. HE is the one who has made this all possible. He is the one who planted this dream in our hearts at just the right moment so we would be ready when the time would come. He is the one who will continue to provide the financial resources through his people. May this entire process be for the glory of God and good of our city. We just get the joy of being a part of it.